Not only are fleas annoying, but also they pose a threat to your pet’s health. This is why you need to have effective measures in place to prevent fleas from being attracted to your yard. Fleas are typically between 1/6 and 1/8 of an inch in length. However, despite being so small, they can jump a very long way – over a foot. In human terms, this would be the equivalent of you or I jumping 295 feet long! Plus, for being such small creatures, they are deadly. They pose significant risks to your pet’s health, and they can pose some human health risks too. With that in mind, read on to discover more about fleas, how to check for a flea infestation in your yard, and what steps you should take to find a flea killer and get rid of fleas once and for all. 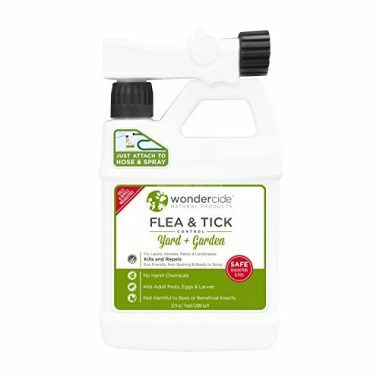 This product from Wondercide enables you to control a wide range of pests, from mosquitoes to ticks and, of course, fleas, without using harsh chemicals. The main ingredient in this product is cedar oil. Cedar oil has long been one of the most effective ingredients for dealing with pests, which is does through blocking octopamine, which is required to regulate metabolism, movement, and heart rate in fleas. This is a recommended product for any households with pets and children. It is an eco-friendly and biodegradable product. You can use it to treat 5,000-square-feet, and this spray comes in a number of different sized containers. 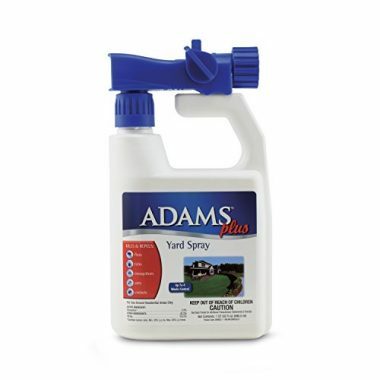 You can use any applicator with this product, and it is safe for use on gardens and lawns, as well as on patios, dog parks, playgrounds, swimming pools, and any other outdoor environment. 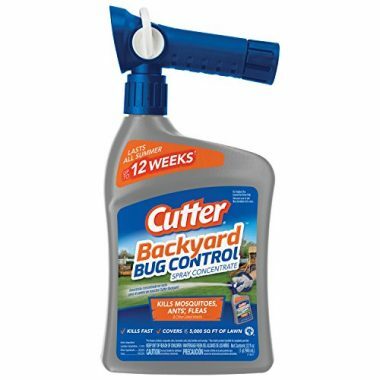 Say goodbye to fleas and other annoying insects, including mosquitoes, with Cutter Backyard Bug Control Spray. A 32-oz container will treat up to 5,000-square-feet, with the effects lasting for up to four weeks, even if there has been rain. 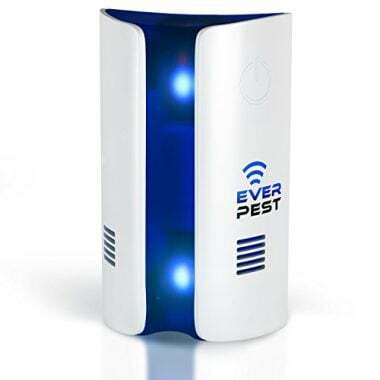 If you are looking for a product that will drive pests away without killing them, you need this dual ultrasonic and electromagnetic pest repeller. This product is one of a kind, featuring a patent pending design, combining the best and most advanced technologies. The LED light bulb emits ultrasound waves, which fleas find annoying to be frank, so they fly away and they don’t come back. Problem solved! It is an efficient, poison-free and organic solution. All you need to do is plug it in, turn it on, and you are good to go and keep those pesky invaders away without causing any risks to pets or humans. This product is not only effective but it is safe too, enabling you to keep fleas away without using any poison or toxins. This is a formula consisting of plant-based ingredients and natural essential oils. This includes eugenol, which is from clove plants, and peppermint oil. It is not harmful to flowers, shrubs, or trees, and so it won’t have an adverse effect on your garden. It is ideal for use on turf and grass areas, covering up to 4,500-square-feet. You can also use it on outdoor surfaces, including decks, asphalt, concrete, and patios. The product is also easy-to-use. All you need to do is connect it to your garden hose. 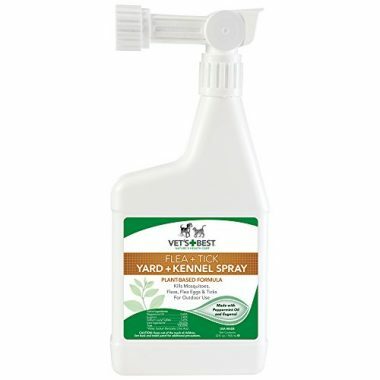 You should then turn on the water, hold down the lock tab and turn the nozzle to the on position, after which you should be able to easily spray this evenly over your entire kennel or yard. It is important to make sure you have even coverage; do not saturate your outside space or create a puddle. 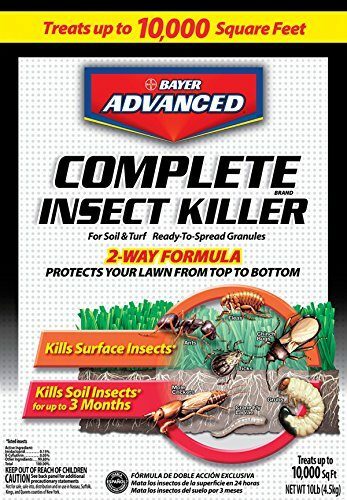 Next on the list we have Bayer Advanced Complete Insect Killer for Soil and Turf Granules, which is a proprietary formula that works in two ways control both soil and surface insects. It will kill soil insects for up to 12 weeks, as well as killing surface insects in 24 hours. 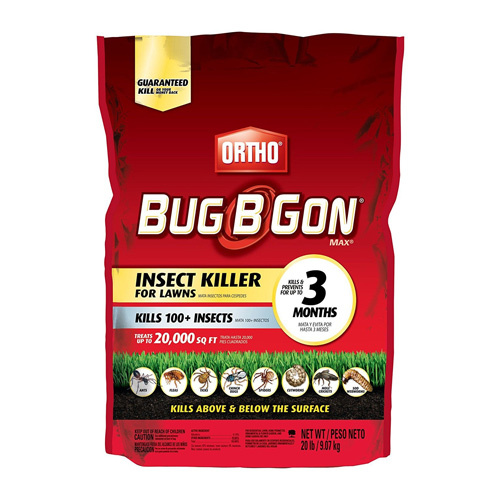 Not only can this product be used to kill fleas, but also it is effective in killing mole crickets, grubs, European crane fly larvae, ticks, and ants. You can treat up to 5,000-square-feet using these granules. 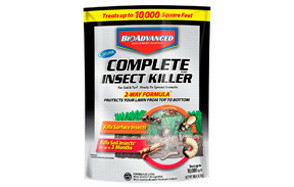 Not only does this product treat fleas, but it can kill and prevent 100 listed insects for as long as three months. This includes both insects below and above the surface, for example, webworms, mole crickets, cutworms, spiders, ticks, and ants. There are many different sized bags you can choose from, with the 20 lb. bag treating up to 20,000-square-feet, so it is a good product if you have a large amount of space to cover. Not only can it be used on lawns, but also it is effective for use on flower begs, vegetable gardens, around the home perimeter, and on ornamentals. Earlier in the list, we introduced you to a Bayer Advanced product for killing fleas, yet this one is different because it is a spray solution. 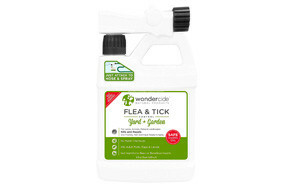 Like the flea killer mentioned above, it is a two-way formula that controls both soil and surface insects. The difference is merely in the way that the flea killer is applied. 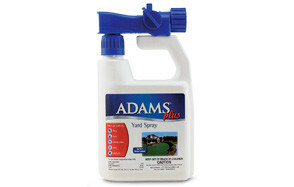 Last but by no means least, we have Adams Plus Flea & Tick Yard Spray. Despite the name of the product, it also kills mosquitoes and ants too, providing pest control for up to four weeks. You can use this product on lawns, flowers, roses, shrubs, and trees. It treats up to 5000-square-feet, is easy-to-apply, and it doesn’t stain, so you don’t need to worry about it having a negative impact on the appearance of your outside space. This is the biggest problem fleas provide for pets, and they provide a number of them! Flea bite dermatitis is a specific allergy to flea saliva. If your pet has this, they can suffer from intense scratching and itching, which is incredibly uncomfortable for them. But it gets worse, as the skin then breaks open because they have been itching so much, and this results in a scab being formed, which can get infected. This can happen on any part of your pet’s skin. Nevertheless, you are most likely to find this on the base of the tail and the back. Not only do fleas cause a wide range of external issues, including skin irritation, but they can also cause internal infections too. Tapeworm infection is a prime example of this. If your pet ingests a flea, they can suffer from tapeworms, as the tapeworm is actually inside of the flea and then it begins to grow inside of your pet. Signs of tapeworms include weight loss and an itchy rear end. Anemia is another type of internal infection your bet may suffer from due to flea infestation. As mentioned, fleas do not only pose a risk to your pet, but they can have a negative impact on your health as well. While fleas do not live on human hair or skin, they can still bite humans, and if the flea is carrying a disease, you can end up catching the likes of cat scratch fever or the plague. 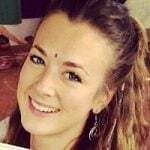 You can see them – Let’s start by pointing out the obvious; if you can see fleas, then you have a problem! Fleas are flat and they don’t have wings. They are roughly 2.5 mm in length, they have six long legs, and they jump far. Your pet is irritated – If your pet is scratching excessively, there is a high chance that they have a problem with fleas. This is especially the case if their skin is red and they have lost hair. For cats, the neck and head are the most commonly targeted areas. For dogs, their hindquarters are most commonly targeted. Flaking skin and scabs – like dandruff deposits. You have been bitten – Another sign that you could have an issue with fleas is if you have been bitten yourself. If you wake up in the morning and you have small red, itchy welts from flea bites on your body, it is probable that fleas are the cause of this. You should check your socks, floor, sheets, and anywhere else that your pets like to hang out to see if there are any specks. These specks could be dead fleas or eggs, and again, this indicates a flea problem. Use water and heat – Another effective method for determining if you have a problem is by attempting to attract fleas with heat. You need dishwashing detergent, warm water, a bowl, and a lamp. Simply fill the bowl with warm water and add a bit of detergent to make it a little bit soapy. Place the bowl on the floor and shine the lamp over the water. The fleas will be attached to the light and jump towards it. So, what is the water for? Well, the fleas will jump into the water, and the soap will kill them, so you not only discover whether you have a flea problem, but you do a good job of killing several in the process. There are many different ways that you can kill fleas if you have a problem in your yard. The easiest way is to use one of the products that are featured in the next section. However, there are some other approaches you can use too. You can use diatomaceous earth, typically shortened to DE, which is widely used to kill pests, including fleas. The good thing about this approach is that there is no risk of injury or sickness to humans or animals. This product appears like sand – they are tiny grains with sharp edges. The edges are sharp for fleas, as they are so small, but they aren’t a problem for humans. So while they will hurt your pesky pests, you can be sure that you won’t be at risk. If you are trying to get rid of fleas in your garden, aside from spraying insecticides, another option is to flood your yard. This can help to kill fleas because it will kill the larvae and eggs. This will help to make certain that future generations of these small and irritating pests are stopped dead in their tracks. Of course, you don’t want to turn your yard into a lake, so do be mindful about how much water you use. Another option is to use a flea trap, which is an electronic device. These traps produce a warm light, which has the purpose of luring the flea. The trap that is set up will do the business in terms of getting rid of the fleas. Flea bomb – Last but not least, you can use a flea bomb, but this is an approach that should most definitely be used with caution. This is because it involves using poison to deal with fleas, which most certainly is not a great idea if you have pets. So there you have it: some of the best products you can use to get rid of the flea problem you are experiencing at your home. However, you may be wondering how long it will take for these products to work their magic. Of course, this largely depends on the product you have chosen, and so it is best to look at the specific instructions to get a better idea regarding how long it will take for the spray or granules to work their magic. Of course, some of the products, for example, the electronic device, will offer immediate action, and you should start to notice results instantly. For other products, you may need to wait between 24 and 48 hours. Please note that you will also need to apply the product continuously, usually every four weeks, but again this does depend on the flea killer you have chosen, in order to ensure you keep the pests at bay forever. For further preventative measure, make sure to also check out our best flea treatment for dogs review and also our flea collar review. There is nothing worse than a flea infestation. Not only can these pests be incredibly annoying and irritating, but also they can pose a serious risk to your health and your pet’s health. If you have noticed any of the signs of a flea infestation that have been mentioned above, it is important to purchase one of the top eight flea killers mentioned on this page so that you can get rid of those pests once and for all so they can no longer harm you or your pets.